Perhaps because in recent years I’ve had the pleasure of spending time with Steven Feld, a senior scholar at SAR, questions related to sound have been on my mind of late. Steve is noted for many things, but his work on cross-cultural acoustics is widely regarded as inspiringly innovative. It’s also true that as I crossed into my mid-60s I experienced a degree of hearing loss —”consistent with your age,” as an audiologist told me, which was cold comfort. That has led me both to regret some of the wall-of-sound rock concerts I attended in the early 1970s and to be much more protective of my hearing than I was in the past. For anyone who cares a great deal about music, the prospect of losing the ability to fully enjoy it is troubling. As I noted in this blog several years ago, the improvisational genius of jazz is something that inspires my writing as an anthropologist, even if the connection is loose rather than direct. So it was with some disappointment that I found myself forced to abandon a recent outdoor performance in Santa Fe by a terrific Kansas City-based Latino band, Making Movies, The group’s music can be described as an amplified, hybridized mélange of Latin American traditions. As the band explains in their website, the latest Making Movies album is “a bold mix of sounds: psychedelia, experimental rock, son cubano, cumbia and various rhythms descended from Yoruba music.” Aside from their formidable musical chops, the band members have been outspoken in their public support of DACA immigrants. When Making Music started to perform on June 2, there was a crowd of perhaps a hundred, and the vibe was classic summer Santa Fe: cheerful, relaxed, ready to dance. But the sound! The amplified roar was beyond ear-splitting, beyond F16-taxiing-for-takeoff intensity. Most of the crowd seemed unperturbed, but I had to retreat— first to a distance of about 50 yards, then 100. At that distance, and behind rather than in front of the band’s PA system, the audio volume seemed about right. Conversations after the event suggested that I wasn’t the only person driven away by the unnecessary intensity of the amplification. I had a similar experience a couple of years ago at a Dwight Yokum concert held at the Santa Fe Opera. (Okay, Yokum’s music isn’t my scene, but it was a fundraiser to which I was invited by a friend.). I had neglected to bring ear protection, and my wife and I were reduced to wadding bits of kleenex in our ears in self-defense. After twenty minutes our host was ready to evacuate, and we followed suit. From the parking lot of the Opera—which, by the way, has excellent acoustics with modest amplification—the volume was about right. The sonic assault seemed to have no effect on most of the audience, some of whom were two-stepping in front of the massive PA speakers as we sprinted for the exit. What’s going on here? A little poking around on the web suggests that I’m not the first to wonder why performances have routinely become so loud that they make the sound of nearby jack-hammers seem almost meditative by comparison. Edward Tufte, known for his book The Visual Display of Quantitative Information and related works, moderates a thoughtful exchange of views about this issue on his website. He and others refer to a 2003 article by Lewis Segal published in the L.A. Times that complains about the sheer acoustic brutality of many concerts. (See also this.). A 2016 article in the Daily Telegraph reported that thirty people walked out of a UB40 concert because the volume affected their heart rhythms and caused one person’s ear to bleed. Yet most of the concert-goers had no complaint about the sound level. Various explanations for this phenomenon have been floated: (1) The increase in ambient noise levels almost everywhere, which habituates people to high levels of background noise, at some cost to public health; (2) the ubiquity of in-ear headphones, which is causing premature hearing loss in the nation’s youth, in turn suggesting that performances must be louder to register on an audience; (3) performances are getting louder because performers want to “turn their amps up to 11,” which isn’t a theory as much as an anecdotal inference; and (4) the possibility that the sheer physicality or somatic impact of ultra-loud music is what draws people to concerts. I’m inclined to view the situation as “overdetermined,” to use a word favored by theory geeks. Urban Americans are now so habituated to high levels of ambient noise and ubiquitous digital music that concerts must achieve higher levels of volume to justify the price of admission. I wonder, too, whether part of the draw is a desire for embodied catharsis, which is hard to find in a society where people work ever-longer hours for ever-smaller salaries. From that perspective, the physical impact of ultra-loud concerts—ringing ears and the like—is a feature rather than a bug. It’s also true that concert-goers have little control over audio levels at the events they attend. Their only options, once they’ve gained admission, are to insert ear protection or head for the door. Later this summer I’m traveling to a place where the only protection I’ll need is insect repellent and sunscreen: the Boundary Waters wilderness of Minnesota, which is blissfully out of cell phone range and where the dominant sounds are the splash of paddles on water and the haunting call of loons. The BWCA lies just to the east of Voyageurs National Park, which has been voted one of the ten quietest places in the United States. I look forward to giving my ears a rest. As many social theorists have pointed out, key characteristics of modernity include the reorganization of space and time, the precise coordination of productive processes, and the rationalizing impact of money. We take these processes for granted and perceive them as “natural” until the system fails, revealing how precarious these integrated networks are beneath their veneer of order. 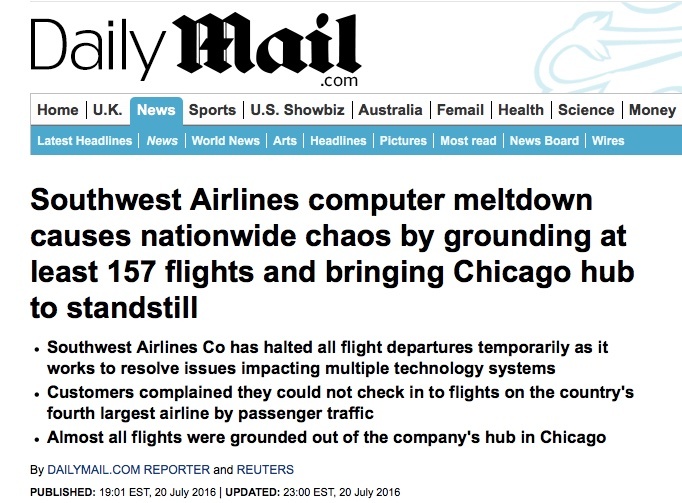 I and 250,000 other airline passengers experienced this on July 20-21 when Southwest Airlines’ computer system experienced a catastrophic meltdown. The source of this collapse and the failure of the company’s backup systems have not to my knowledge been revealed in much detail. And in reality the why didn’t much matter to me and, I suspect, most of the passengers who found themselves camped out in airports with no flights available for many hours and in some cases days. What we knew is that the system was in collapse, Southwest ground personnel seemed as uninformed as the rest of us, and the cascading failure spread from the airline in all directions to include car rental agencies and hotels. Albany (ALB), 7/20, 2100 hrs, ET. My evening flight to Albuquerque with a connection at Chicago Midway is running late. No big deal. Ground personnel in Albany announce that there is a computer “problem” but that most of our connecting flights are running late, too, suggesting that when we get to Chicago, most of us will make our connections. Some of them may know or suspect that the computer systems are down and that the finely tuned coordination of Southwest’s flight system would most unlikely unravel. But no one suggests that we return home and fly after the mess is cleaned up. Chicago (MDW), 7/20, 2215 hrs CT. Chaos in the terminal. The list of canceled flights, including mine, scrolls by endlessly. There’s a long line to a gate desk, and I get in it with a few others from my flight, although there are no Southwest personnel working the halls to explain where we should queue and for what. Two hours pass and I’m still probably 90 minutes away from reaching a Southwest staff member. Comments from passengers who make it to the front of the line indicate that it’s pointless to wait because the computers aren’t working well and there are no flights to transfer to, now or tomorrow. (Later it’s revealed that Southwest has canceled 700 flights that day, which must represent–what?–at least 100.000 passengers.) Southwest personnel are giving away bags of peanuts and bottles of water but no information. There are rumored to be cots and blankets available in Terminal A. My fellow passengers seem surprisingly cheerful or at least resigned. Presumably Southwest flight crews have hit their FAA-determined service limit and are forced to rest. No other crews are available to replace them. What to do? Wait around and hope that something opens up? Head for a hotel and come back in a few days? Take a midnight cab to O’Hare and pray that another airline can accommodate me? A riddle. Then I discover, more or less by accident, that a Southwest flight to Denver is departing and that it has a couple of seats available. To my astonishment, I’m allowed to board even though the maimed system can produce no boarding passes. What the heck; Denver gets me within driving distance of Santa Fe, my ultimate destination. Denver International (DEN), 7/21, 0230 hrs MT. Hundreds of passengers are wandering around like survivors of a zombie apocalypse. A courteous Southwest employee tells me that there might be a seat on a flight to Albuquerque in 10 hours. Maybe. (I later learned that this flight was canceled, along with 450 others on 7/21.) OK, I think, time for a rental car and a motel room. There’s one room left at the airport hotel, a Westin. $575 plus tax, I’m told, which is above my pay grade. The nice desk clerk at the Westin, who has little else to do at 0300 hrs, tells me that every hotel room within twenty miles of Denver International is booked. Worse still, every rental car in the airport has been snapped up by evacuating Southwest passengers, a story that I confirm by calling the toll-free numbers of three rental companies, after which I give up. At this point I feel not like the survivor of a zombie apocalypse but like one of the zombies. Last ditch strategy: American Airlines has ticket agents in the check-in area at 0400 hrs. One tells me that there’s a seat available on a United flight to Albuquerque leaving at 0755 hrs. The flight, which lasts about an hour, costs considerably more than my entire round-trip ticket on Southwest. But I purchase it without hesitation. Albuquerque (ABQ), 7/21, 0930 hrs MT. On the ground in New Mexico and headed for a shower and sleep in Santa Fe. My luggage isn’t there of course. It is delivered to me 36 hours later in Santa Fe on a day when Southwest canceled 250 more flights. Lessons? For me the lesson is not that Southwest is an incompetent airline, although it arguably should shake up its IT staff until they can make its systems suitably robust. I actually like Southwest: its simplicity and democracy and the absence of Mickey Mouse fees and the ability to change flights without penalty and its transparent frequent-flyer program. It doesn’t promise more than it (usually) delivers, which I guess is consistent with the fact that so far it hasn’t offered compensation commensurate with the financial harm that I and many other passengers suffered. To a social scientist the Southwest meltdown is an inevitable expression of capitalist logic, the unceasing effort to squeeze more profit out of operations. For Southwest this has given its shareholders 160 consecutive quarterly dividends. How does it obtain these profits? Among other things, it gins up a high load factor (87 percent average occupancy in June 2016 and close to 100 percent on most of the flights I’ve been on in recent months). It tightens up its flight turnaround times to keep its expensive planes in the air generating revenue. All that’s fine until there’s a hiccup in the system, with ripple effects that can last for days. After all, if your planes are already full, you have a limited capacity to re-book passengers when a flight is canceled. When you cancel a thousand flights, the system totally seizes up. This is an inevitable result of designing your system for profit rather than robustness—the ability to adapt successfully to the challenges of a complex, unpredictable world. Is your attention span too short to get you through this blog post? 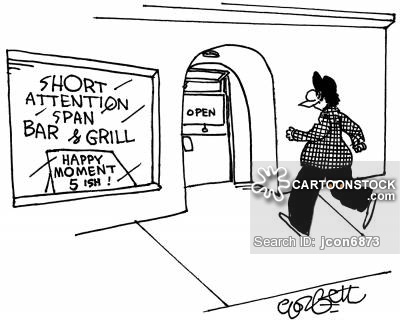 Short Attention Span Bar & Grill…Happy moment, 5ish! There’s a point at which political communication speeds past the last stop where democratic deliberation, the genuine consent of the governed, is possible. An instant poll, of that sort that pops up on your screen while you’re attempting to read debate coverage, encourages snap and solitary judgment, the very opposite of what’s necessary for the exercise of good citizenship.--Jill Lepore, “The Party Crashers,” The New Yorker, 2/22/2016. If you’re an American, you’re probably tired of the incessant nattering about presidential politics that is all one can find on CNN, MSNBC, and Fox during this season of party primaries. And we’re still months away from the actual election. At the same time, it’s hard to take one’s eyes off the slow-motion train-wreck that U.S. politics has become. A quick glance at serious journalism reveals a long list of explanations for why this is happening: the corrupting influence of moneyed political-action groups; the fragmentation of media, which invites people to pay attention only to those sources of information that pander to their prejudices; the hyperbolic End Times rhetoric of the 21st century Republican party; the anxiety or simmering rage of working- and middle-class Americans who feel, with considerable justification, that they are being abandoned by our social system, and so on. All of these theories have a degree of merit. Our current political reality is, as the mandarins of social theory like to say, “overdetermined.” Still, I often cycle back to the allegation that promoting much of this chaos is our declining attention span, which produces an unwillingness to ponder and assess the claims that politicians of both parties make during their campaigns, to think slowly and deeply about the character of the men and women who are asking for our votes. No one seems to care that the tax-cutting schemes pitched by candidates on the right are, when appraised carefully by economists, judged certain to increase the national debt far beyond its present lamentable state. However much one may admire Bernie Sanders, how plausible is it that the policies he advocates can provide a free college education for every American who desires one? Aspects of the claim that new media are changing human cognition were explored prominently in Neil Postman’s prophetic book Amusing Ourselves to Death: Public Discourse in the Age of Show Business (1985) and in a somewhat different way by Nicholas Carr in The Shallows: What the Internet is Doing to Our Brains (2011). And it’s not just the Internet: cinema studies have shown that since 1930 the average shot length has declined from 12 seconds to 2.5. This process attracted public attention (for only a nanosecond or so) with the publication of a study purporting to show that goldfish have a longer attention span than humans. I was obliged to think about this recently when the organization I direct undertook a revision of its mission statement. The statement I inherited ran to nearly 120 words and consisted of long, boggy phrases that were mostly lists of things we did and for whom. To be fair, the organization has an unusually complicated mission that reflects a complex history. We run academic seminars, manage anthropology’s biggest book award, steward a spectacular collection of Native American art from the Southwest, offer resident fellowships for scholars and Indigenous artists, etc., etc. It’s thus not easy to come up with a concise statement of the mission that would be suitable for the legendary “elevator pitch.” The elevator pitch, I gather, emerged from Silicon Valley and refers to the thirty seconds or so in which entrepreneurial supplicants must convince a venture capitalist to provide them with millions of dollars to turn an idea into a viable business. With the help of several board members, I drafted a punchier version of the mission statement that was about half the length of the original. It was duly approved by the full board. Yet even before the digital ink was dry, a visiting team of investment consultants had scornfully dismissed the new, shorter statement as unacceptably long. A study of mission statements insists, based on a review of 50 prominent non-profits, that their average length is 15.3 words (“excluding brand references”) and that the top 20 examples average only 9.5 words. The winner is TED, whose mission statement consists of two words, “Spreading Ideas.” OK, but what kind of ideas? To whom are they spread and how? Does anything happen after these ideas are disseminated, or does TED simply move on to the next? A mystery. Reflecting on this comparative work, I’m prompted to ask, Why should a complex institution be expected—indeed, required—to account for more than a century of history in ten words or less? The main reason seems to be the brevity of attention spans in a noisy world of competing claims. Persons and institutions are now reduced to “brands” not unlike breakfast cereals. Attention must be captured quickly before the consumer/potential donor moves on to the next shiny box on the shelf. Failure to formulate a pitch capable of grabbing this attention is now seen as evidence of institutional disarray or incompetence. No surprise, then, that politics and many other arenas of modern life have been reduced to a marketplace of slogans that have powerful emotive force (“I’m a true conservative.” “Make America great again.”) without evoking deeper questions about the why, the how, the when. Which suggests that I’ve got work to do to improve this blog. My honest if unstated mission statement would be something like “Stuff I write to amuse myself at 5 a.m. before another day of strategic planning meetings and reviewing fund-drive spreadsheets” (20 words). That clearly won’t do. How about “Making anthropology great again!” or “Traveling upriver to profound truths”? Not quite there yet, but I’m working on it.